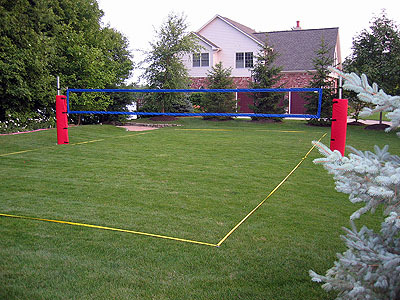 Constructing a grass volleyball court can be simple or more complex depending on how nice you would like your court to be. Many of our customers prefer to install a sleeve in the grass allowing them to simply pop caps off their sleeves, slide in their poles, clip their nets on and they are ready to go. 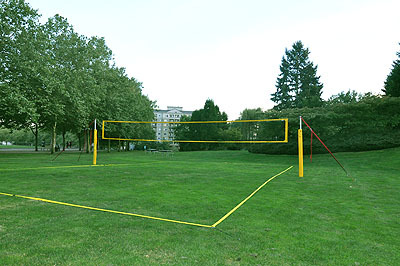 The in-ground Permanent / Semi-Permanent sets use larger diameter poles to reduce pole flex. 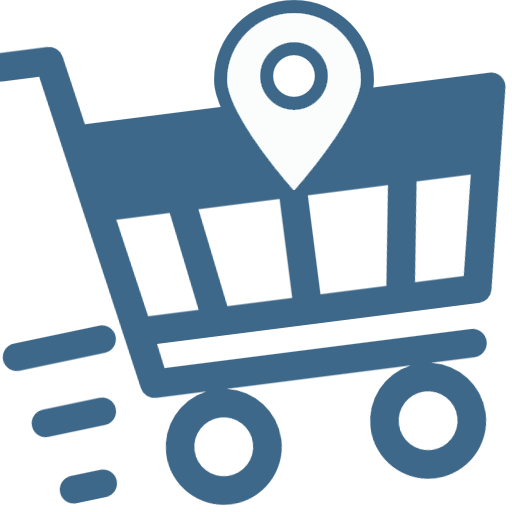 We manufacture the poles in both galvanized steel and aluminum with most people opting for aluminum because of their light weight advantages. 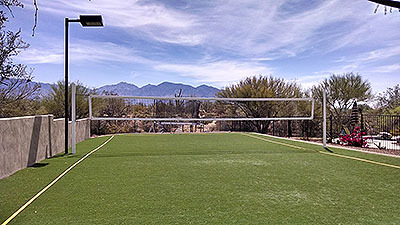 As a company that prides itself on helping people throughout the world build the nicest, most used volleyball courts around we felt it was important for us to offer complete support for those who wished to install an artificial turf court. 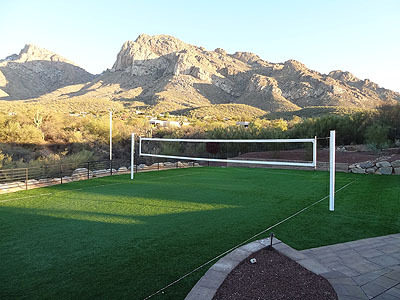 We work with contractors around the country who can offer a start to finish job or we can provide over 140 different types of turf to meet your volleyball needs if you wish to build your turf court yourself. 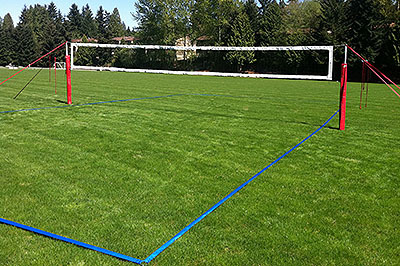 The turf courts can ship with boundary lines or without. Our variety of turf options allow us to match your existing grass if you wish to install artificial turf within your existing lawn or to match grass types in your area. Below are some of our more popular options. 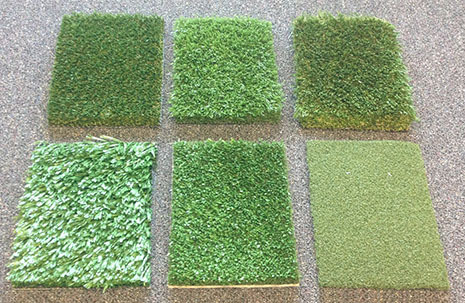 We sell artificial turf by the square foot or in pre-made court sizes. We sell it with stainless steel mounting stakes for the edges with seaming tape and glue to bond sections together. In addition to the turf we rent turf transporters to get the turf rolls from the street to your desired install location. 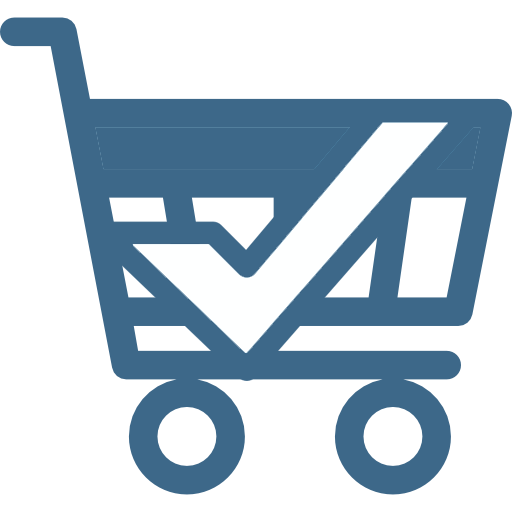 Due to number of steps involved with building a turf court easily, we recommending calling 1-800-494-3933 to go over your proposed site and conditions. Click on links below for larger photos. 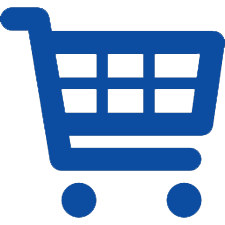 Call Toll Free To Order 1-800-494-3933 Open 8 a.m. to 6 p.m. Everyday.